Hello there and welcome to the Clearly Besotted July Teasers. The new release will be hitting the shops on the 5th July. From now until then, the design team along with our fabulous guests Laura Bassen and Kay Miller, will be sharing teasers with you. 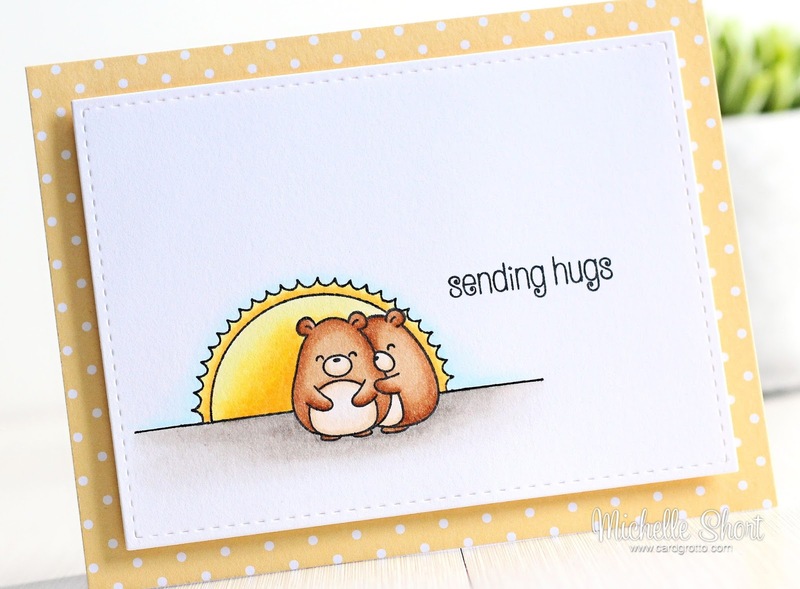 My card today uses the super cute Happy Hugs set. It is so adorable! I started off by stamping the little hugging bears on to a piece of white cardstock (cut using the ME Femme Frame rectangle die). I then stamped these again on masking paper, cut this out and added it over the top on the stamped panel. I then stamped the sun image over the top and extended the side lines a little using a black Copic Multiliner. I stamped the sentiment, from the same set, to the side. The image was then coloured using Copic Markers. I took a piece of paper from the MFT Lucky prints paper pad and adhered this to the front of an A2 white card base. The image panel was added to the card with foam sheet. COPIC MARKERS - Bear: E37, E35, E33, E31, E50. Sun: Y19, Y17, Y15, Y13, Y11. Sky: B000, B0000, 0. Ground: W5, W3, W2, W1, W0. 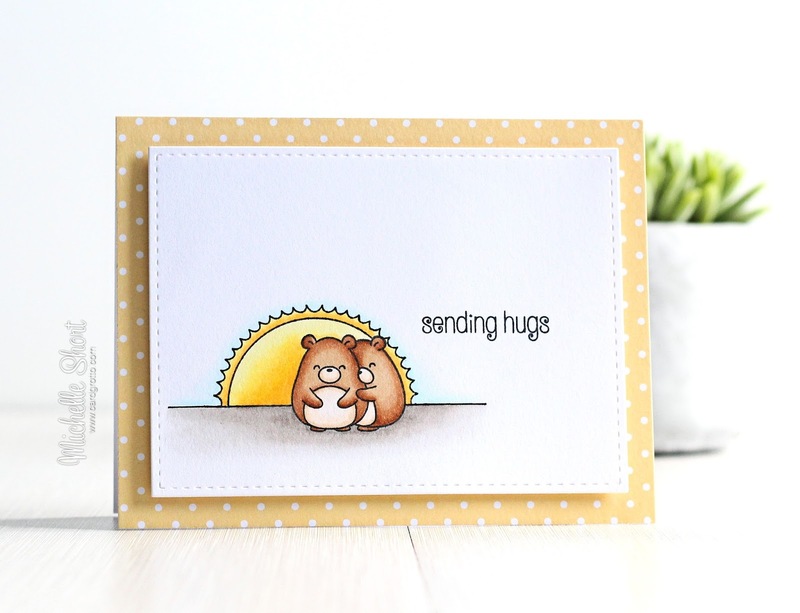 Please pop over and see Stephanie, who will not only have some mazing cards to share, she will also have links to all the other DT and GDT sharing today. Thanks so much for visiting me today, see you tomorrow. A card that simply puts a smile on your face!! What an absolutely sweet card to send someone in need of a "happy mail" hug, Michelle. Lovely colouring & shading. So absolutely precious!! You did a beautiful job with this set!! This is just too cute...as sweet as can be.